This is a reminder that Brooklyn's Community Board 14 (CB14) is holding a Public Hearing on the Flatbush Rezoning Proposal this Thursday, April 2, at 7pm at P.S. 249. [GMAP] This is the first public review of the proposal since NYC's Department of City Planning (DCP) certified the proposal on March 2. This will be the first of the four public reviews which the proposal must undergo before it becomes law. The ULURP "clock" requires that CB14 complete their review and submit their decision by May 11, though they're likely to finish within two weeks. The CB14 Executive Committee meets next Monday, and the regular CB14 monthly meeting is the Monday after that, April 13. Approval by CB14 and the Borough President are widely seen as a fait accompli. We anticipate opposition from developers - whose community interests usually take the form of build, take the money, and run - for the DCP and City Council hearings. We also anticipate that they will be greatly outnumbered by community members supporting the proposal. This is a reminder that the Memorial Gathering for Robert "Bob" Guskind will be held this Saturday, April 4, from 2pm to 5pm at the Brooklyn Lyceum, 227 4th Avenue, between President and Union Streets, in Park Slope, Brooklyn. RSVP via Evite. In lieu of flowers, Bob's family and friends invite donations in his memory to four organizations which "were very close to his heart." Mosquito control is a perennial topic on the Flatbush Family Network, one of the numerous email discussion groups which cover the different neighborhoods of Brooklyn. 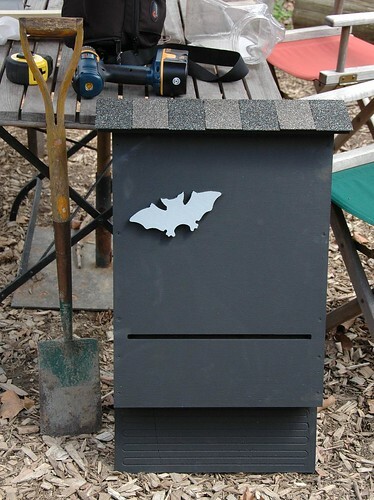 Bat houses invariably come up as a way of attracting a natural predator to keep mosquito populations in check. Here I'm reprising and updating my posts on these and related topics from last year. 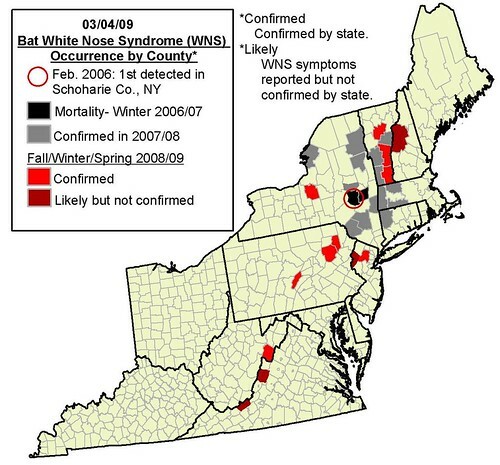 Last Spring I wrote about White-Nose Syndrome (WNS). A breakthrough that occurred just in the past few months is that the "White-Nose" has been identified as a group of previously unknown species of Geomyces fungus. It's still unknown whether it's a symptom - such as an opportunistic infection - or a cause or contributor. Bats exhibiting white-nose syndrome in Hailes Cave, Albany County, NY, one of the first caves in which WNS was observed. Photo: Nancy Heaslip, NYS DEC.
Bob Hoke of the District of Columbia Grotto (DCG) of the National Speleological Society (NSS) maintains an excellent chronology of WNS news and understanding. WNS has already killed hundreds of thousands of bats across the northeast over the past four winters. Mortality has been as high as 90% in some caves. It's estimated that 75% of northeastern bats have died in just four years. Unfortunately, it continues to spread; for the first time, it's also been found or suspected in New Hampshire, New Jersey, Pennsylania, Virginia and West Virginia. Nationally, researchers should use clothing and gear that has never been in caves in a WNS-affected or adjoining state. This also applies to mines used by cavers. These recommendations will remain in effect until the mechanisms behind transmission of WNS are understood, and/or the means to mitigate the risk of human-assisted transport are developed. There was a big thing that came out in the environmental reports last year that chemical mosquito killers are quite bad for the environment and killed more than just mosquitoes. They might even be part of the reason why there is a bacteria/virus killing off northeastern bats. Although, scientists haven't found anything conclusive it seems. WNS research is ongoing, but it's still not known what the cause is. A plausible explanation is immunodeficiency caused by environmental contamination, such as insecticides sprayed for West Nile Virus, but again, that's just one of several hypotheses being explored by researchers. A pathogen such as a virus, bacteria or fungus is likely due to the patterns by which it's spreading. Bat houses seem like a great idea. At night, bats eat about 1,000 pesky insects an hour. I don't know how one attracts bats to your bat house but I've seen them in the evening in Prospect Park, amazing little creatures that they are. I wrote about bat houses last year. Bats have specific requirements for roosting sites. Most of the houses I've seen commercially available are too small or lacking in other requirements. 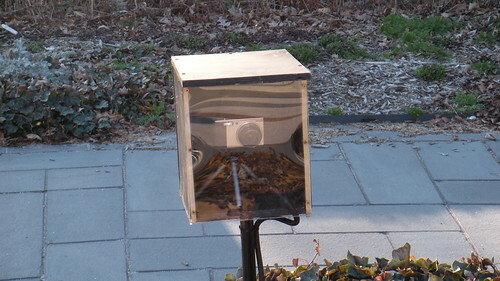 The National Wildlife Federation (NWF) article, "Why I Built a Bat House," contains detailed instructions for building a house that meets current knowledge about bats roosting needs. The bat house I purchased last year from Bat Conservation International before I installed it on the side of the second floor porch - my "tree fort" - at the back of my house. Note that this is the time of year when bats are looking for their "summer homes." I put mine up mid-April last year, which was a little late. I'm hoping they find it and set up house this year! Is there ANY danger to my 4 year old son? Do bats poop/pee/spit anything bad for him? Do they really only come out at night? Bats really do only come out at night. You're most likely to see them at dusk, when they leave their roosts, and dawn, when they return. At the end of last summer, I saw a few on my block flying amidst the gaps between the canopies of the street trees. They seemed to be feasting on the insects attracted to the street lights. Many people are concerned about rabies. While sensible caution is warranted, the risk is extremely low. In New York City, you're more likely to contract West Nile Virus (WNV), which bats help combat by eating mosquitoes which carry the virus. If you see any normally nocturnal animal - such as a bat, raccoon or opossum - out in the open during the day, keep children and pets away from it and notify animal control by calling 311. An excellent chronology of WNS is maintained by Bob Hoke of the District of Columbia Grotto (DCG) of the National Speleological Society (NSS). 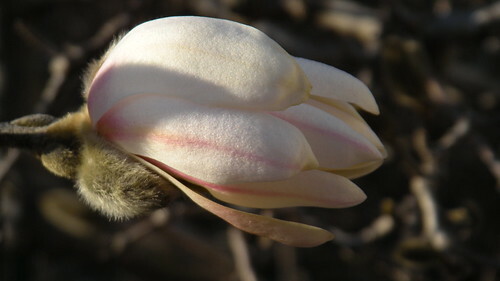 The flower above is one of thousands that are now opening in the Brooklyn Botanic Garden's Magnolia Plaza. With warmer temperatures expected today and the next few days, this weekend and next week will be a spectacular time to visit. Even the flowers still in bud can't wait to join the stage. Actually, the Magnolia zenii blooms first at BBG [not M. stellata, as I had written], but it's in the back corner of the Discovery Garden so most people over 3' tall miss it. 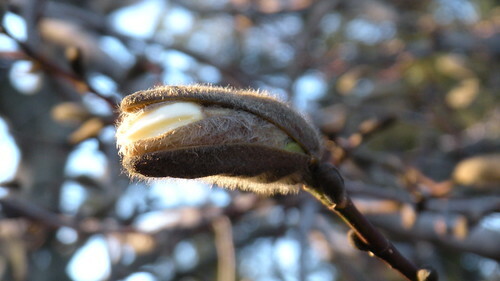 Most of the Magnolias will follow M. stellata, Star Magnolia, in quick succession. Sometimes the bloom on a tree lasts only a week, depending on the weather. You should visit in person at least once over the next three weeks. But this year, for the first time even distant visitors will have a chance to witness the parade of bloom, thanks to one of Dave Allen's time-lapse videos, now in the process off being captured. A memorial gathering to honor the memory of Robert Guskind will be held from 2 pm to 5 pm Saturday, April 4 at the Brooklyn Lyceum, 4th Avenue between Union and President Streets in Park Slope. There will be an opportunity to donate to charities in Bob’s name. Thanks to Eric Richmond of the Brooklyn Lyceum for generously donating the space. Space is limited, so RSVP. Despite this morning's snow flurries, the March equinox (vernal in the northern hemisphere, autumnal in the southern hemisphere) occurred this morning at 7:44 AM Eastern Time (UTC-04:00, since it's now Eastern Daylight Time). By convention, this marks the "official" start of Spring, though we've been tracking signs of Spring closely for a few weeks now. For the third year, I'm using the image above to illustrate this post. I like the story of Demeter and Persephone. Winter doesn't occur because Hades is evil/dark/etc. Persephone was not the keeper of the earth. The earth didn't miss her, Demeter did. Demeter grieved for her loss, and neglected her gardening duties, and that's why Winter occurs. Demeter rejoices at the return of Persephone, which restores her interest in the world, and that's when we get Spring. The recently-certified Flatbush Rezoning Proposal is now available on the Department of City Planning's (DCP) Web site. Community Board 14 Review 60 days. Must be completed by May 11, 2009. I'm planning to attend tomorrow evening's briefing on inclusionary housing. I'm not familiar with it and want to learn more, particularly with regard to the provisions on the rezoning proposal. There's also a flowering apricot (Prunus mume) in bloom at the same location. The cherry is the tree on the left, the apricot is on the right. Brooklyn now has its own “Immigrant Express” — the Q/B Train — cutting through Flatbush to Brighton Beach and home to growing numbers of foreign born residents from Guyana, El Salvador, Poland, Armenia and Turkey. Census Tract 520 comprises the eastern half of Ditmas Park West, my neighborhood neighbor to the south, plus the blocks between Newkirk and Foster Avenues. Brooklyn's Community Board 14 (CB14) has scheduled the first public hearing for the Flatbush Rezoning Proposal for Thursday, April 2, at 7pm at P.S. 249 on Caton Avenue between Marlborough and Rugby Roads [GMAP]. 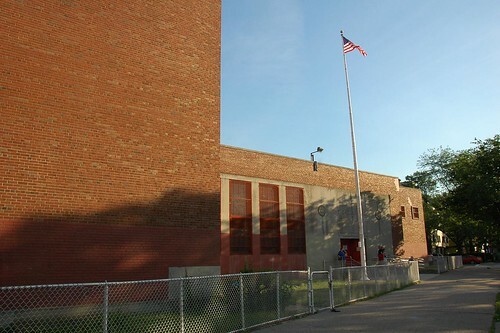 The Caton Avenue facade of P.S. 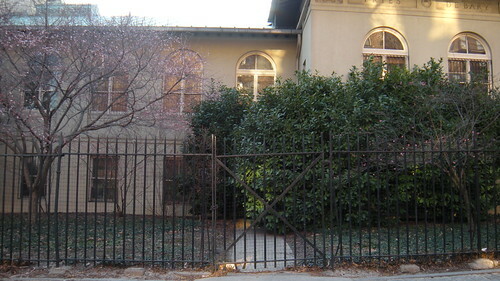 249, where the main entrance is located. The announcement on CB14's blog also provides links to view or download all sections of the proposal in PDF format. This is the first time this material has been available online. DCP made the proposal available on their Web site on March 18. Thursday night I attended the Flatbush Development Corporation's (FDC) 34th Anniversary Benefit Dinner. In my remarks, as one of the honorees, I spoke of the connections and communities that had brought me there that night: my partner, my neighborhood, Flatbush at large, and the Brooklyn blogosphere. 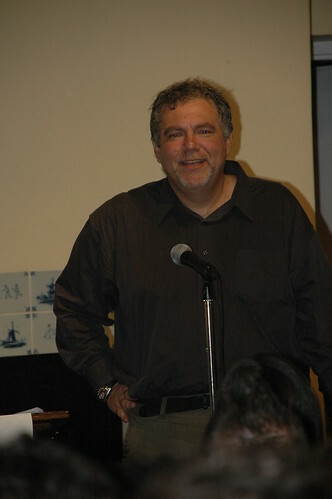 I also told the 200+ people assembled there that Brooklyn bloggers had lost one of our own last week: Robert Guskind, founder of Gowanus Lounge, a friend and supporter of this blog and of Flatbush preservation efforts. I only met Bob in person a few times. We launched our blogs within one month of each other in 2006: Gowanus Lounge in April, Flatbush Gardener in May. Gowanus Lounge quickly became Bob's bully pulpit from which he could speak, as friend and neighbor Brenda Becker phrased so well, as "Fool-Killer and Weasel-Slayer." I don't remember when I first discovered Gowanus Lounge, but the first links from there to this blog appeared in November of that year. Bob liked - or at least thought least unflattering! 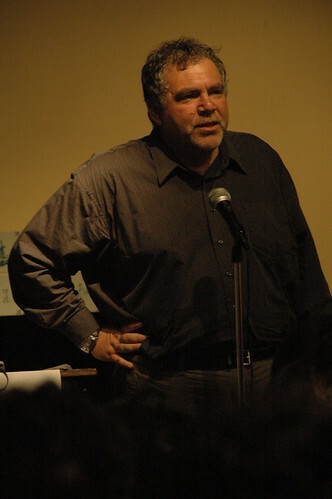 - this picture I took of him at the 2nd Annual Brooklyn Blogfest in 2007. When the Second Brooklyn Blogfest came around in May 2007, we knew each other well from our online endeavors. We didn't get to meet at that time; it was too crowded, and too hectic. Bob, a speaker at the event, was an A-List blogger of the Brooklyn blogosphere, swarmed with fans, colleagues, and reporters. Dave Kenny, another friend and blogging colleague, and I co-founded the Brooklyn Blogade as a way to continue the energy and relationship-building from the Blogfest, and expand into neighborhoods that were "underserved" by the Brooklyn blogosphere. Dave credits a discussion with Bob after the 2007 Blogfest as inspiring him to start the Blogades. With Anne Pope of Sustainable Flatbush, I co-hosted the first Blogade here in Flatbush in June 2007, and that's where Bob and I finally got to meet in person. The New York Times covered that first Blogade; a photograph from the event opens their article in this weekend's The City section on the future of Gowanus Lounge, the first time any of those photos have appeared. I met Bob again on only two occasions after that. Most of our communication was online, through email, tips, and mutual links. I don't know how many scores of times Bob linked to this blog. I was especially touched by his last link at the end of January, in which he referred to me as "a friend and fellow blogger." As I write this, I still can't believe he's gone. We were the same age, and I wish there had been more opportunities and time for us to strengthen that friendship. As many others have reported in their remembrances of him, Bob was generous in linking. He brought attention to many neighborhood issues that, I believe, without his support would have been overlooked not only by the general press, but other bloggers as well. He nurtured community in the Brooklyn blogosphere. When I reached out to him by email during lasts fall's hiatus on Gowanus Lounge, he said that he had received "hundreds of emails and comments." In response to his death, nearly 80 people have written their own condolences and memorial posts to Bob. There are many hundreds more comments across all those posts. That stands as a testament to the impact he has had, and will continue to have after his death. He was generous and passionate, sensitive and courageous, humorous and outspoken, gregarious and private. I have learned only since his death that we shared a journey in recovery, different in the details, similar in struggle and spirit. I did not know Bob well enough or long enough to know the circumstances of his life or death. Whatever the circumstances, I have nothing but empathy for the man; they cannot diminish my opinion of him. Real people are complex, their circumstances, usually complicated. It's cost me a lot to learn that. This was Bob's favorite of my photos. 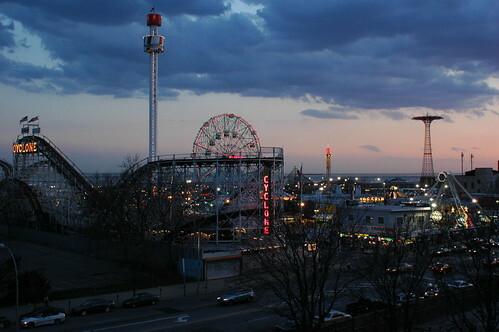 I know this, not only because the subject shows Coney Island - among Bob's greatest passions - in its glory, but because he chose this from the Flickr-Moo mini-cards I handed out at 2007's Blogfest and the first Brooklyn Blogade. If there is a heaven, may this be part of Bob's. Update: The problem is largely isolated to Google Reader subscribers. If you use Google Reader to view the feed from this blog, and have been having trouble since March 6, please try re-susbcribing to see if that corrects the problem. Update: Feedburner stats confirm that my subscribers were cut in half - the number of them, not the individuals - from March 6 to March 7. Still researching the problem. I just noticed that my count of Feedburner subscribers has suddenly dropped from around 175 to just around 105. I believe this is related to my Feedburner feed getting migrated from the old Feedburner to the new Google/Feedburner. I just logged into Feedburner and migrated the feed. I'm hoping that fixes the glitch. Please let me know, either via comments and by the email in my profile, if you encounter any lasting problems. The New York City Department of City Planning has agreed to brief our Board on the Inclusionary Housing Zoning Text Amendment. This is particularly important because, upon the anticipated adoption of the Flatbush rezoning proposal, these Inclusionary Housing rules will apply to certain portions of our district. It's an "emergency" meeting because details for this meeting were not available when they published their March calendar of meetings. By providing a floor area bonus for the construction or preservation of affordable housing, inclusionary zoning harnesses the strength of the city's housing market to create a mix of units for low- and moderate-income families along with market-rate apartments. The expanded [in 2005] Inclusionary Housing Program, which can be applied in areas being rezoned to medium- and high-density residential districts, combines a zoning floor area bonus with a variety of housing subsidy programs to create powerful incentives for the development and preservation of affordable housing. Developments taking advantage of the full bonus in the new program must devote at least 20 percent of their residential floor area to housing that will remain permanently affordable to lower-income households. 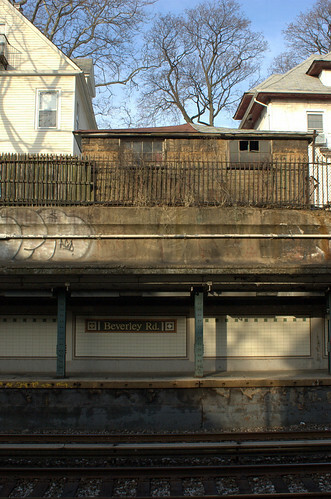 The Department of City Planning (DCP) is responsible for identifying eligible areas in rezoning plans, such as that for Flatbush. The Department of Housing Preservation and Development (HPD) is responsible for administering housing built according to the program. Sunday was warm, highs in the 60s (F). 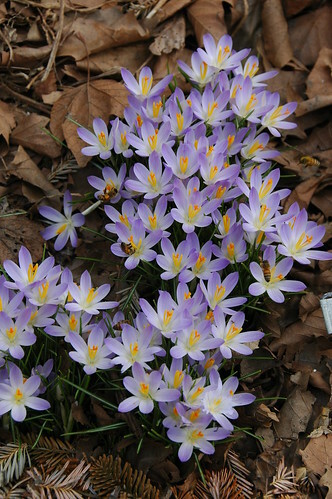 The Crocus were open. And the honeybees were swarming over them. There are at least five (5) honeybees in this photo. Can you find them all? The Eranthis in the above photo have not persisted. 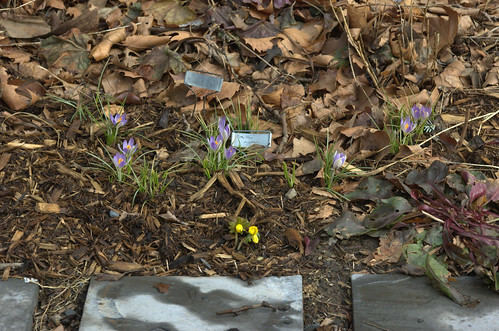 You can see how the Crocus have thrived. FDC traditionally honors people who have made outstanding contributions to the Flatbush community. Along with neighborhood association and business honorees, this year, FDC's 34th Anniversary Award recipient will be Wendy Weller-Jones, long time neighborhood resident, and FDC volunteer. Her dedication and commitment to Flatbush Development Corporation and the community has been tremendous. Individual tickets are $135; total contribution less $80.00 per ticket is tax deductible. To purchase tickets, call FDC at (718)859-3800. The benefit and journal proceeds will help offset the financial cutbacks to our funding from city, state and foundation grants. Proceeds from this event will support the FDC programs and initiatives that help to build a strong community. These include commercial revitalization economic development activities; after-school programs for children and teens; recreation, mediation and health programs for at-risk teenagers; housing assistance to landlords, tenants, homeowners and cooperators; and assistance to our area's immigrant residents. Meet at 12noon tomorrow at the corner of 9th Avenue and 39th Street [GMAP] to rally in support of creating a new community garden in Sunset Park: the Culver Community Garden. The group is organizing to convert the currently vacant lots on either side of the 9th Avenue station of the D/M subway line into public green spaces. Meanwhile, comments and questions are welcomed. They will be moderated. Please give us time. 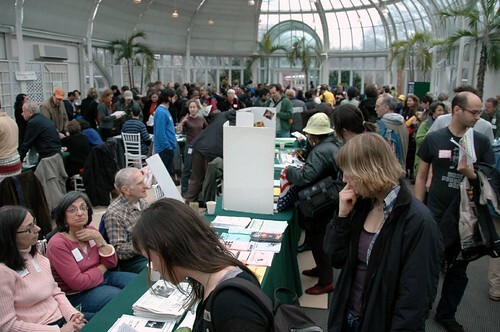 This Saturday, March 7, from 10am to 4pm, Greenbridge, the Brooklyn Botanic Garden's Community Horticulture program, hosts its 28th annual Making Brooklyn Bloom. This year's theme is Growing Up Green: Guiding Youth from Gardening to Green-Collar Jobs. Registration, Coffee, and Exhibits in the Palm House: You must register on the day of the event to secure space in a workshop. Movies: Several short films will be shown in the auditorium beginning at 12:15 p.m., including BBG Children's Garden footage ca. 1930s, a short film on school gardening, and several videos made by green teens. 4 p.m.: Pick Up a Spring Gift Bag as You Leave! Some of these will be held at 11 a.m. and some at 3 p.m.; the schedule will be announced at registration. You will have a chance to choose only two workshops, one from each time block, space permitting. We recommend that you arrive early to get your first choices. Sassafras albidum, Sassafras, is a medium-sized deciduous tree in the Lauraceae, the Laurel family. This is a family of mostly pantropical, evergreen shrubs and trees; Sassafras has the most northern distribution of the Lauraceae. Sassafras is widespread in eastern North America, from Maine to Ontario and Michigan, south to Florida and eastern Texas. It's most common as a successional plant in disturbed areas. Because of its wide natural range, select a local ecotype, or acquire from a local nursery, for best adaptation to your conditions. Propagation from root cuttings is possible. Clusters of flowers with bright yellow sepals appear in early Spring, just before the leaf buds break. 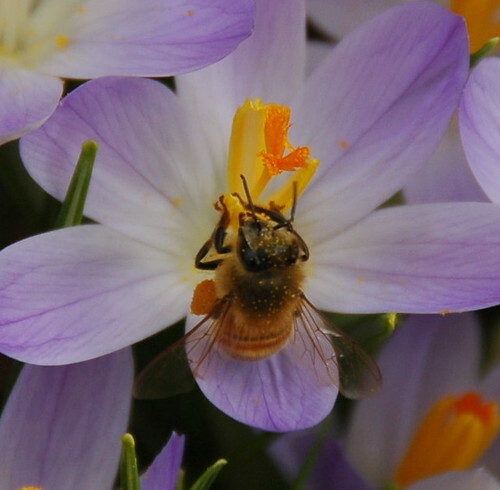 Flowers are pollinated by bees and flies. Fruit are produced every year or two after the plant reaches maturity at about ten years of age. Fruit matures in the Fall. The fruit is an oil-rich, oval, blue-black drupe held on a red stem. Sassafras fruits are eaten by many species of birds. Update 2009-05-15: The City Planning Commission (CPC) hearing is scheduled for Wednesday, June 3 at their offices at 22 Reade Street in downtown Manhattan. Sign in at 10am to testify. Earlier today the City Planning Commission certified the Flatbush Rezoning Proposal. It now enters the public review process that is ULURP: the Uniform Land Use Review Procedure. The proposal covers a huge area: 180 blocks, nearly the entire northern half of Community Board 14. 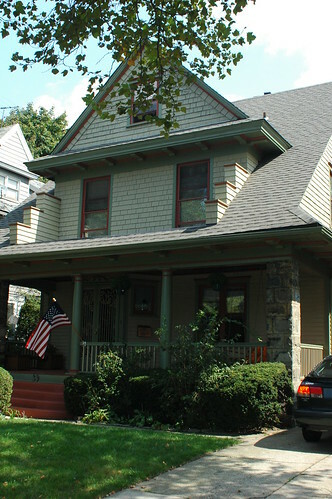 The proposal, developed over a three year period in close consultation with Community Board 14, community members, local elected officials and neighborhood civic associations, would protect the diversity of scale and character of the area’s Victorian homes, row houses and apartment buildings by updating zoning to reflect the existing built character. The comprehensive community-based proposal furthers the Bloomberg Administration’s sustainable planning goals by rezoning to protect one of the city’s special lower-density neighborhoods while also providing opportunities for modest growth and permanently affordable housing along wide corridors well served by mass transit. Community efforts for rezoning go back more than the three years DCP has officially been involved. It was a topic of discussion at the first neighborhood association meeting we attended, more than four years ago. Update 2009-03-02 08:00: Just back from shoveling a few hundred square feet of steps, walkway and sidewalk. Snow is 5" deep on the sidewalk, 6-6.5" deep on the ground, drifting higher. Snow is still falling, and predictions are for another 2-4" during the day on top of what we already have from last night. The National Weather Service has issued a Winter Storm Warning for the New York City tri-state area from 6pm tonight through 6pm Monday evening. A "major snowstorm" will drop 6 to 14 inches of snow, depending on location, with wind gusts up to 35 MPH. The point forecast for Flatbush is projecting accumulations of over 13" and steady winds of over 25 MPH. Alternate side parking rules are suspended city-wide to facilitate snow removal. Update 2009-03-02: All NYC public schools are closed, the first time in five years.